Natural resources are vital for food and environmental security and for providing stable livelihoods. It is now widely accepted that attention has to be paid on conservation and management of natural resources. Fruit-based agroforestry model is an alternative land use system that integrates the cultivation of cash crops (vegetables, spices, pulses) along with fruit trees. This provides significant opportunities for livelihood improvement through nutritional and economic security of the poor people and reduction in distress migration. It also improves the quality of human life and soil health. Environmentally, agroforestry practices reduce soil erosion, improve ground water and moderate micro-climate. Having the potential of carbon sequestration which is a phenomenon for storage of carbon dioxide, agroforestry has an important contribution in mitigation of greenhouse gas emissions. Recognising the ability of agroforestry systems to address multiple problems and deliver multiple benefits, the IPCC Third Assessment Report on Climate Change (IPCC, 2001) states that “Agroforestry can both sequester carbon and produce a range of economic, environmental and socio-economic benefits. For example, trees in agroforestry farms improve soil fertility through control of erosion, maintenance of soil organic matter, providing increased nitrogen and promotion of more closed nutrient cycling.” We believe that agroforestry interventions provide the best ‘no regrets’ adaptation measures in making communities resilient to the challenges posed by the changing and variable climate. Based on the successful experiences of agro-horti based tribal development programmes in Jhansi and Shivpuri districts of Bundelkhand, Development Alternatives promoted small orchards, popularly known as ‘WADI’ with 1600 families in Sonebhadra district of Uttar Pradesh, India. The WADI is developed as a 1-acre orchard with around 95 fruit trees comprising of mango (60) and guava (35) plantation (spacing 8m x 8m), and vegetables and spices as the main crop. The periphery of the WADI is bio-fenced with forestry, fuel or timber species. A combination of cattle protection trenches and farm bunds around the periphery help conserve soil and water and keeps grazing animals at bay. Fruit tree-based production system offers suitable option for profitable utilisation of the rainfed uplands. It was observed that heavy mortality of the plants during the summer season due to grazing and lack of irrigation are two major factors, which discouraged the farmers to take up mango and guava orcharding. So, Development Alternatives helped in the development of a profitable system with income f rom the first year onwards. This helped in motivating the farmers to take up fruit orcharding. The WADI model employs scientific methods to optimise production. The selection of appropriate orchard species is based on the analysis of agro-climatic conditions, soil type, slope and drainage. High yielding and early fruiting varieties are adopted along with improved techniques such as integrated and organic farming systems. The seasonal crops for inter-cropping are selected so as to ensure crop rotation with one leguminous crop a year to enrich soil nitrogen levels. As the fruit trees grow, the growing canopy also influences the micro-climate making it possible to grow shade loving high value crops. The economic viability of the WADI model is proven. A typical WADI of 1 acre requires an investment of around Rs. 55,000/- including initial establishment cost and subsequent maintenance cost over 3-5 years. The financial returns in the first three years are only from the cash crops and range between INR 40,000-50,000 each year. The fruit trees take 3-4 years to mature and start yielding harvests adding an extra revenue stream. By the 5th year, the annual farm incomes go up exponentially to at least INR 1,00,000-1,50,000/- each year. The land and water management practices that form an integral component of the WADI model leads to a host of ecological co-benefits such as enhanced ground water recharge and reduced soil erosion losses. The plantation of trees leads to significant carbon sequestration. Established as clusters, WADIS also impact the micro-climate leading to improved local biodiversity. The use of organic fertilisers and pesticides leads to gradual improvement in soil organic content and water holding capacity of the land. 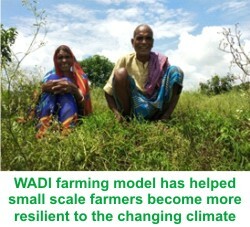 The WADI model is climate resilient and can be adopted on partially degraded lands on which conventional agriculture is not possible and is therefore a suitable solution for reclaiming degraded lands for productive use. Shobhnath, aged 72 years is a resident of Piparwaha village of Chopan block of Sonebhadra district. He was facing a severe issue of livelihood security. His family barely managed to eke out a living by doing daily wage labour at the nearby Dala and Renukoot markets. Development Alternatives provided him support with an opportunity to achieve a greater level of income enhancement through the integrated approach of a agri-horti based livelihood model, that makes farming profitable even on small plots. In 2016, he planted 60 mango and 35 guava saplings on his farm. Apart from this, he also sowed seasonal crops. The Development Alternatives team further linked him to the Micro Irrigation Department of Sonebhadra. While his WADI was under development, he sold his seasonal farm produce and availed water resources (bore well) for irrigation of his farm land. He has graduated to growing vegetables, spices (turmeric, ginger) and oilseeds (groundnuts, mustard) along with mango and guava. The multi-tier cropping pattern ensures nutritional security for Shobhnath’s family. This model has helped Shobhnath pay off all his debts and get his daughter married. At present, Shobhnath and his family are proud owners of a full grown WADI that is a model of sustainable development and livelihood security.